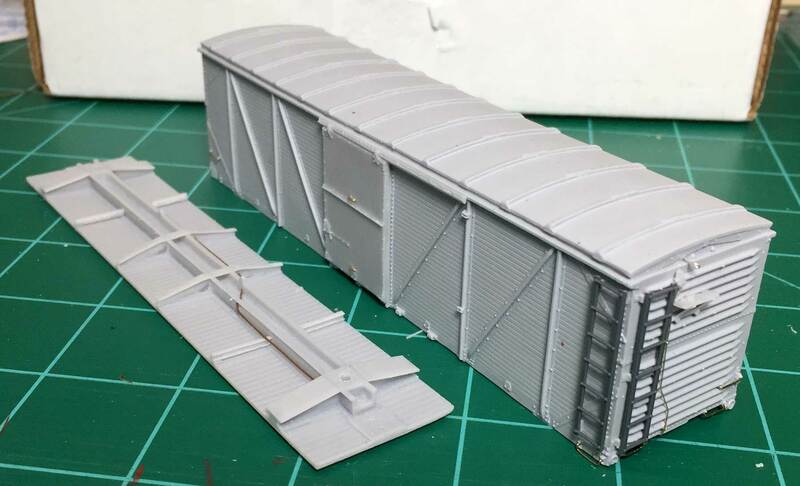 Resin Car Works web guy Eric Hansmann has been working on an HO scale boxcar kit. Here’s a progress report. I needed to break out of a summer slump so I started a few resin freight car kits. This Southern Pacific B-50-15 boxcar is leading the pack out of the car shops. It’s the latest kit from Westerfield Models. The lead image shows the current kit progress. George Toman shared an update on a June Workbench Wednesday post. Here’s George with the scoop. 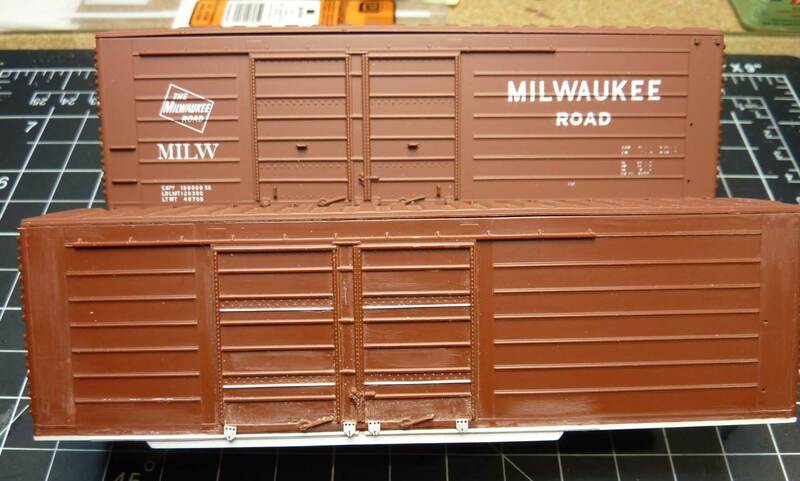 Progress has been made on my Rib Side Cars Milwaukee Road automobile boxcar. I had the car mostly complete at St Louis RPM and since have primed and painted as MILW 6582. The lead image shows the model in primer and paint. Jerry Hamsmith sent an update on his growing CB&Q freight car fleet. Here’s his report. I thought I might share some of what I have been working on in terms of rolling stock for my circa 1955 Chicago Burlington and Quincy – Beardstown Division layout. This division linked the southern Illinois coal fields with the major metropolitan areas in northern Illinois, Wisconsin and Minnesota, among others. In 1955, the Q coal hauling fleet, consisting of 2- and 3- bay hoppers and composite drop bottom gons, was still about 40 percent gons. Here is another group of drop bottom gons I am currently working on. I do them in batches as I need a large number of them and that speeds up the process. Both steel end and wood end cars are in the current batch. I currently have a total of 33 finished composite gondola cars on the layout. Here is a photo of one of the already completed cars on the layout. 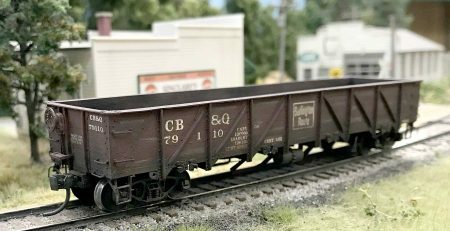 Jerry offers kits for these CB&Q coal gondolas. A PDF of currently available kits and decals can be found on the RCW blog Helpful Links page. George Toman sent a few photos of his latest work on an HO scale Rib Side Cars kit. Here are his notes and photos. On my list of must build cars is a 40-foot Milwaukee Road double-door automobile boxcars. The 6500 series cars were built in 1942. A photo of MILW 6582 on page 10 of Railway Prototype Cyclopedia (RPCyc), Volume 13 is my inspiration. The starting point is a Rib Side Cars 40-foot, short rib kit with 12-foot double-doors. Following are photos and some info on my modifications so far in this build.